I was rummaging through old cookbooks and came across a gem…a simple and obvious pasta sauce, but I have now made it three times in three weeks because I can’t get enough of it. The recipe comes from the Mama Agata cookbook—a restaurant and cooking school on the Amalfi Coast. Larry found the cookbook and bought it for me after a magical trip to Sorrento and the Amalfi Coast several years ago so that we could continue to enjoy the food we fell in love with there. 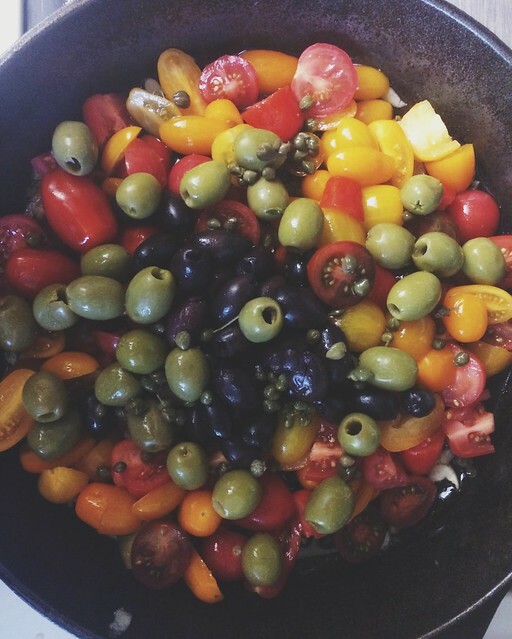 Use really good quality olives for a better flavor (from an olive bar or preserved in oil instead of in water). But in a pinch, olives in a jar work, too. 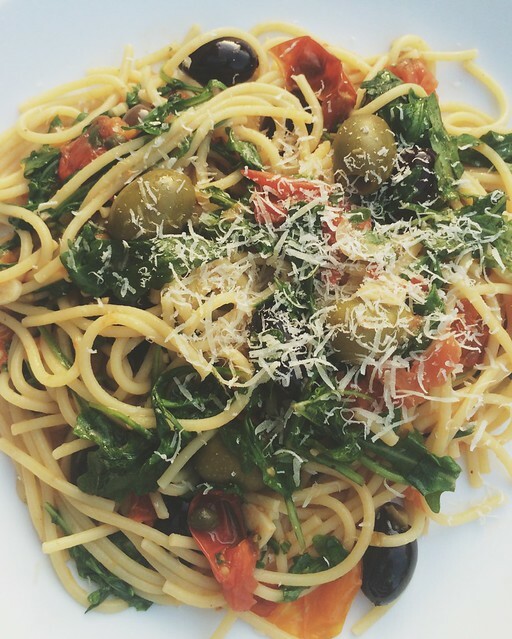 And if you are gluten free, use Bionaturae gluten free spaghetti, as it is wonderful. This sauce is also amazing over quinoa, for those of you who want to cut down on your carbs. 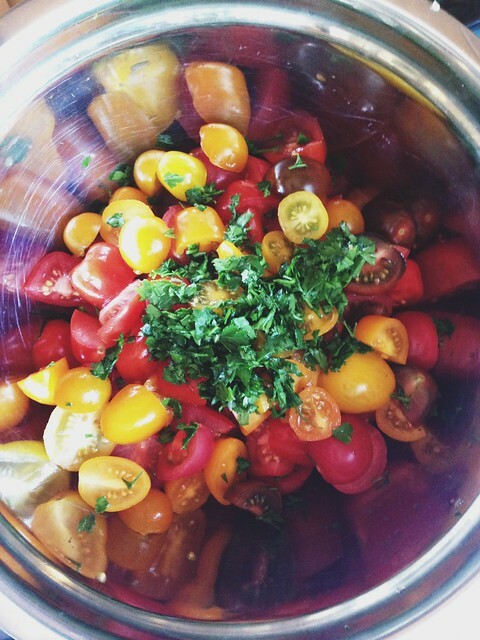 Cut the tomatoes in half and place them in a bowl with the chopped parsley. (Parsley is added to the tomatoes before heating them in oil to enhance the flavor of the tomatoes.) NOTE: if the cherry tomatoes are very large, you’ll need to cut them into quarters. Thinly slice the garlic and add it to the room-temperature extra virgin olive oil. 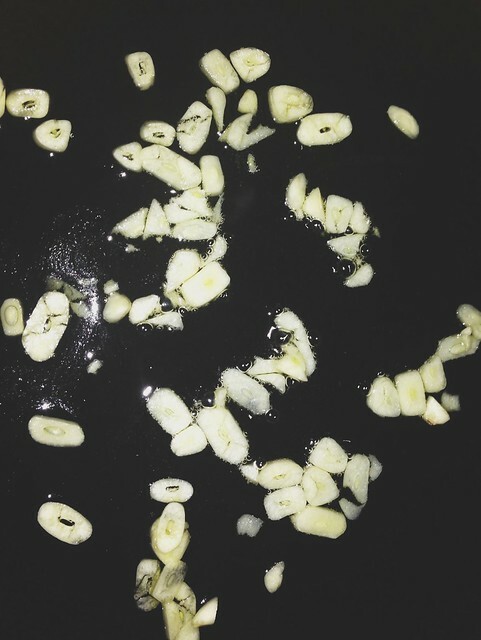 Slowly heat the garlic and oil over a very low temperature so that the flavor of the garlic will pass into the oil as it cooks the garlic. 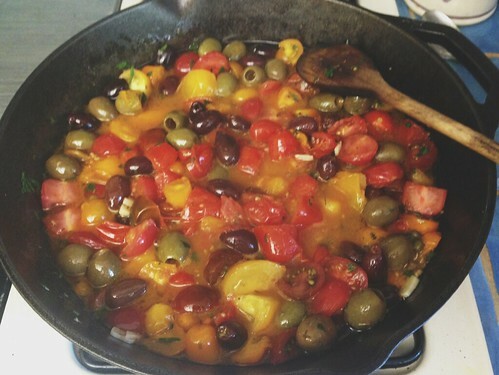 When the oil and garlic are warmed and gently cooked, add the tomatoes and parsley, olives, and capers to the pan. Cook for an additional 5 minutes, or until the tomatoes are soft. If you can’t find capers packed in salt, add some salt to taste. If you do find these capers, make sure you rinse them or they will be TOO salty. Boil pasta until it is al dente. 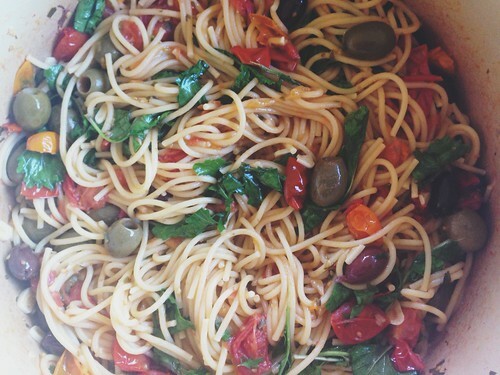 Drain pasta and add to the sauce. Cook for an additional two minutes. 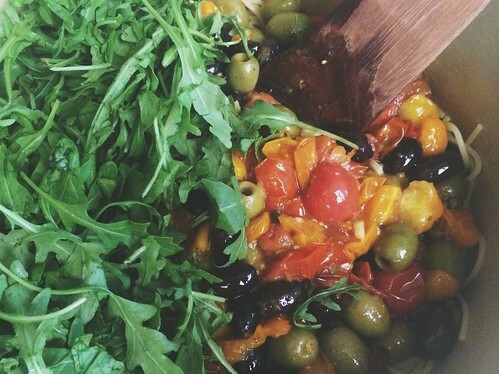 Add the arugula leaves just prior to serving so that they don’t lose their flavor. Serve hot with a drizzle of olive oil to further enhance the flavors. Dust with Parmesan cheese, if desired.